I introduced my mom to the concept of blogs by the countless links I send her of things that I think are cool. She has since introduced me to a couple of blogs in return. One of them is Lesley Téllez's The Mija Chronicles, where she blogs about learning to cook Mexican food as a young Mexican American expat currently living in Mexico City. Back in September Lesley bought some huauzontle at market and decided to dedicate a week to exploring how she could cook with it. What is huauzontle? Sounds really exotic, doesn't it? Its a Mexican green that's botanically related to quinoa, although its eaten fresh, prepared like spinach or broccoli, and not as a grain. 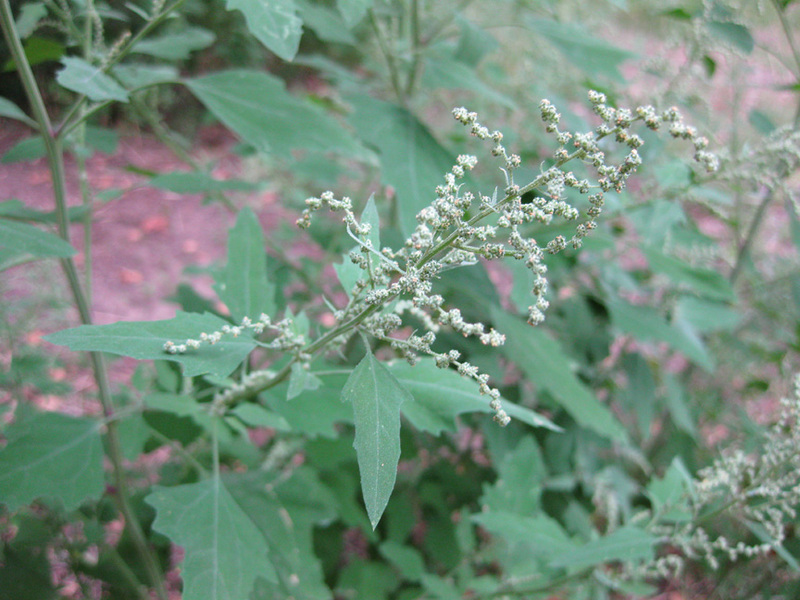 When I looked at Lesley's photos I thought it looked like a heartier version of a weed that we call lambs quarters here in New Mexico, or quelites in Spanish. Its also known as wild spinach, and as far as I know, only the leaves are commonly eaten here in New Mexico. Lesley was preparing the flower heads. Had the lambs quarters in our yard not been forming their own flower clusters I may not have noticed the similarities. Lesley Téllez's huauzontle. Photo used with her permission. The lamb's quarters growing in our yard in September. The leaves look identical, although Lesley's seems to be a brighter green. Lamb's quarters leaves are a little fuzzy, and the flower/seed heads are not as dense. My mom moved to New Mexico in 1965 as a VISTA volunteer. She was posted up in Dixon where she worked with a local community organizer to do things like set up the volunteer fire department. In the early 60s a lot of the villages in Northern New Mexico were still very isolated, and a lot of the older people still spoke primarily Spanish, cooked on woodstoves, and ate very simple foods that they grew themselves, like beans, chile, apples and things they foraged, like quelites, and watercress. Either up in Dixon, or in the next few years when she was living in Santa Fe, my mom learned to pick quelites and add them to a pot of beans. Every once in awhile you'll see them on a menu at a New Mexican restaurant (Padillas has them on whichever day their special is carnitas-- Tuesdays? ), sautéed with onions, but its generally actually spinach in that case. My mom saw someone selling them at the Downtown Farmer's Market this summer, but you probably won't find them in a regular supermarket. A day or two after reading Lesley's first post about huauzontles, I picked some of the lambs quarters from our yard to try preparing them her way. I'd never cooked the flower heads before, but I like to experiment. I just blanched them quickly in boiling water and made a simple cheese quesadilla, served with a side of tomatillo salsa. 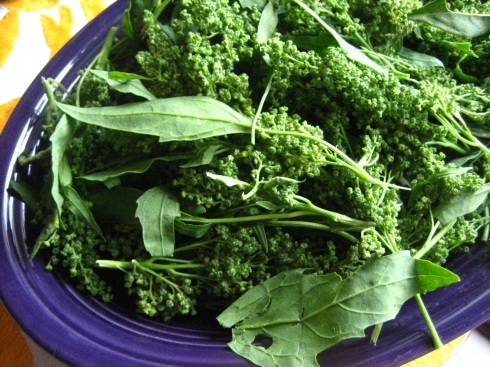 The lambs quarters really do taste like spinach, a very mild flavor, but this gave a bit of crunch. It was good, but not super exciting. 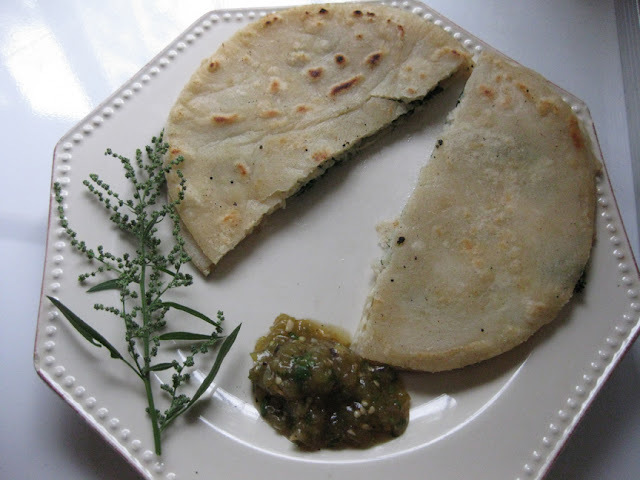 My lambs quarters quesadilla with roasted tomatillo salsa. A few weeks later, much to my surprise, I went to Pro's Ranch Market and found actual huauzontle in the produce department. It's flower heads were on steroids compared to my lambs quarters, and all of the leaves had been plucked off prior to display, but I snatched it up. This whole bunch cost $0.79. The huauzontle that I purchased at Pro's Ranch Market. We prepared it much the same way as the first time, in quesadillas. I should have stuffed chicken breasts and served it all with a molé sauce like Lesley did, since I always buy molé at Pro's these days. Maybe next time. 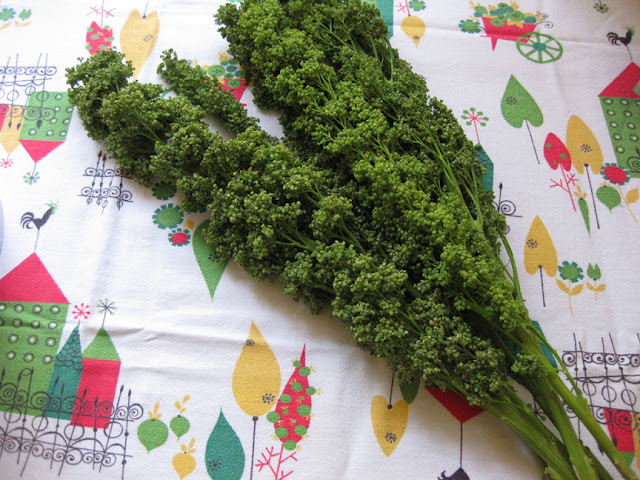 In the future I won't bother to buy the huauzontle, but will just use the lambs quarters. In terms of flavor, I didn't discern any difference, but at least I know that the lambs quarters in our yard are grown without pesticides. According to this article by Deborah Madison, lambs quarters, also known as goosefeet weed, grows all over the United States. So keep an eye out for it where you live. Hmmm- wonder if this is something we would get this far north....I can't recall ever seeing it but will keep my eyes peeled. We do have a very good Mexican store in Kensington Market that imports all sorts of things.